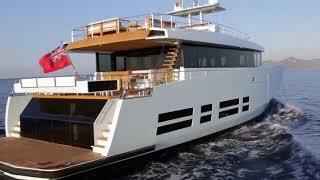 WallyAce motor yacht 'Kanga' was built in 2012 by Wally. Previously named Wallyace Kanga's interior layout sleeps up to 9 guests in 4 rooms, including a master suite, 1 VIP stateroom, 2 twin cabins and 2 pullman beds. She is also capable of carrying up to 5 crew onboard to ensure a relaxed luxury yacht experience. Timeless styling, beautiful furnishings and sumptuous seating feature throughout to create an elegant and comfortable atmosphere.